I have had a sinus infection for the last couple of weeks. I think I got the creepin crud on the airplane during my last trip. I had been on vacation, not eating right, my sleep was disturbed, and my immune system got tired. Believe me I tried all the natural remedies which encourage your body to heal. I needed results, now. Since I started my yoga teacher training I find I am hanging upside down more than normal and the extra mucus was causing problems in my inverted life. I went to see our family doctor and he gave me an antibiotic, Cephalexin, promising it would do the job. They called the prescription in to my Publix Pharmacy. When I arrived to pick it up I was shocked and amazed the cost of the prescription was zero dollars. Is it normal not to charge for prescriptions? How do they make money? Please excuse my ignorance I don’t take prescription drugs very often, this was a surprise. I have only been on the product for a few days; I can already tell when I get done with this course of antibiotics I will have to repopulate my digestive system with good friendly bacteria, which help with metabolizing food, absorbing nutrients, and preventing harmful bacteria to get reestablished. These friendly bacteria are called probiotics. 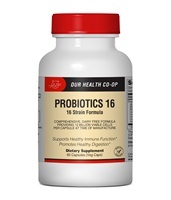 For those of you that don’t know, Our Health Co-op Probiotics 16, has 16 Strains of friendly bacteria and 12 Billion beneficial bugs per cap I will be as good as new in no time. I feel the difference in my digestion when I am not taking Probiotics 16. For anyone on antibiotics this is a necessary step to restart your digestive system, AFTER you are done with your meds. If you take the probiotics at the same time you are taking antibiotics the new friendly bacteria will meet with an untimely death and be of no use. Probiotics 16 are always fresh because of their popularity, we reorder several times each year to ensure activity, and our warehouse is environmentally controlled. If you need some digestive help this may be an answer you want to consider.